In this application protocol, we describe the differentiation of human pluripotent stem cells (hPSCs) into cardiomyocytes, the isolation of the resulting cardiomyocytes, and their analysis using flow cytometry or immunofluorescence microscopy. PBE buffer: Prepare a solution containing phosphate-buffered saline (PBS), pH 7.2, 0.5 % bovine serum albumin (BSA), and 2 mM EDTA by diluting MACS BSA Stock Solution (# 130‑091-376) 1:20 with autoMACS® Rinsing Solution (# 130‑091-222). Keep buffer cold (2−8 °C). Degas buffer before use, as air bubbles could block the column. ▲ Note: EDTA can be replaced by other supplements such as anticoagulant citrate dextrose formula-A (ACD-A) or citrate phosphate dextrose (CPD). BSA can be replaced by other proteins such as human serum albumin, human serum, or fetal bovine serum (FBS). Buffers or media containing Ca2+ or Mg2+ are not recommended for use. MACS Columns and MACS Separators: For optimal purity and recovery, the use of LS Columns for depletion of non-cardiomyocytes as well as for the subsequent positive selection of PSC-derived cardiomyocytes is strongly recommended. Positive selection and depletion can also be performed using the autoMACS Pro Separator. With this protocol, cardiomyocytes can be generated from hPSCs with efficacies of up to 80%, giving rise to contracting cells in 9–12 days. ▲ Note: Testing of various cell numbers and CHIR99021 concentrations is recommended to optimize differentiation for each individual hPSC line. The diagram below provides a graphical overview of the procedure. Outline of the differentiation protocol. hPSCs are maintained under xeno-free conditions in StemMACS iPS-Brew XF Medium and differentiated into cardiomyocytes using a monolayer protocol with consecutive activation (CHIR99021) and inhibition (IWR-1) of Wnt signaling. hPSCs are maintained under xeno-free conditions in StemMACS iPS-Brew Medium and differentiated into cardiomyocytes using a monolayer protocol with consecutive activation (CHIR99021) and inhibition (IWR-1) of Wnt signaling. Use hPSCs at 90 % confluence. Remove culture medium and wash cells once with DPBS w/o Ca2+ and Mg2+. Add 1 mL TrypLE™ Select Enzyme to each well containing hPSCs (6-well plate). Incubate for 5 minutes at 37 °C. Stop enzymatic reaction by adding 1 mL/well of Soybean Trypsin Inhibitor. Dissociate cell layer to obtain a single-cell suspension by pipetting up and down using a 5 mL serological pipette. Determine cell number using the MACSQuant® Analyzer 10. Centrifuge cell suspension at 125×g for 5 minutes to collect cells. Aspirate supernatant completely. Adjust cell densities (1.5–7×10⁵ cells/mL) in StemMACS™ iPS-Brew XF + 2 μM StemMACS Thiazovivin. Seed cells into a Matrigel® Matrix–coated 12-well plate with a final volume of 1 mL per well. ▲Note: The effectiveness of differentiation depends on the number of seeded cells. Therefore, it is crucial to determine the cell number that leads to optimal differentiation. Different cell numbers might be required for different hPSC lines. Replace medium in each well with 1 mL StemMACS iPS-Brew XF. Prepare medium RPMI 1640 + L-glutamine + B-27® Supplement, minus insulin with different CHIR99021 concentrations (8–12 μM). Replace medium in each well with 1 mL of the prepared CHIR99021-containing medium. ▲Note: Cells should be confluent at this point. Incubate with CHIR99021 for exactly 24 hours. Replace medium in each well with 2 mL of RPMI 1640 + L-glutamine + B-27 Supplement, minus insulin. Remove 1 mL/well of the old cell culture medium and transfer it into a tube. Add 1 mL/well fresh RPMI 1640 + L-glutamine + B-27 Supplement, minus insulin into the tube. Add 5 μM IWR-1 into the tube. Replace medium in each cell culture well with 2 mL of the conditioned medium created in steps 1–3. Replace medium in each well with 2 mL of RPMI 1640 + L-glutamine + B-27 Supplement w/insulin, and continue to do so every 2–3 days. Cardiomyocytes differentiated from hPSCs and analyzed by flow cytometry and immunofluorescence microscopy. Differentiated cells display a high expression level of cardiomyocyte-specific marker troponin T, as shown by flow cytometry (left). The use of recombinantly engineered REAfinity™ Antibodies against cardiac troponin T, α-actinin, or other cardiomyocyte-specific markers like myosin heavy chain, MLC2a, and MLC2v, allows a detailed analysis of cardiomyocytes and respective subtypes. Immunofluorescence microscopy (right) revealed the typical cardiomyocyte morphology and sarcomeric structure. 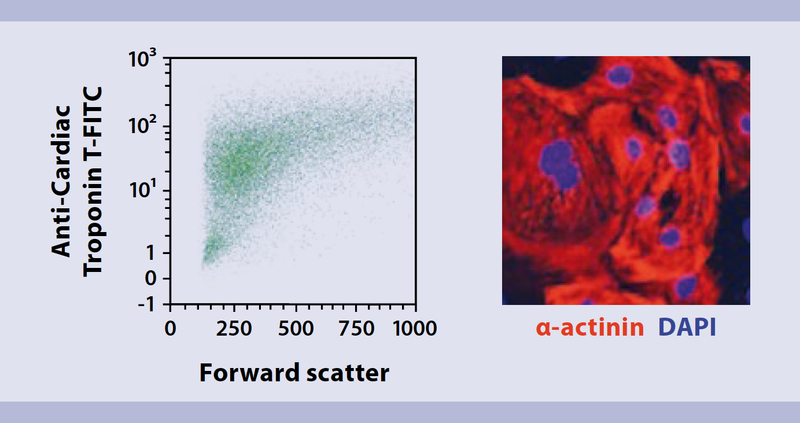 Differentiated cells displayed a high expression level of the cardiomyocyte-specific marker troponin T, as shown by flow cytometry (left). The use of recombinantly engineered REAfinity Antibodies against cardiac troponin T, α-actinin, or other cardiomyocyte-specific markers like myosin heavy chain, MLC2a, and MLC2v, allows a detailed analysis of cardiomyocytes and respective subtypes. Immunofluorescence microscopy revealed the typical cardiomyocyte morphology and sarcomeric structure. The development of highly efficient cardiac-directed differentiation methods makes it possible to generate large numbers of cardiomyocytes.1,4 However, due to varying differentiation efficiencies, cardiomyocyte populations must be further enriched for downstream applications. To achieve highest possible purity and recovery during cell separation, first dissociate the monolayer cultures into a single-cell suspension using the Multi Tissue Dissociation Kit 3. ▲ Note: Perform all steps under sterile conditions. ▲ Note: The dissociation protocol is optimized for use with 12-well or 6-well plates. Remove cell culture supernatant from the cultured cells. Prepare enzyme mix by adding Enzyme T to Buffer X of the Multi Tissue Dissociation Kit 3 in a ratio of 1:10, for example, add 50 μL of Enzyme T to 450 μL of Buffer X.
Incubate cells for 10 minutes at 37 °C. Gently detach cells from the dish by pipetting 3 times up and down using a 1 mL pipette. ▲Note: For late stage differentiation it may be necessary to pipette more often. Apply the cells to a MACS® SmartStrainer (70 μm) placed on a 50 mL tube. Determine the cell number and proceed to "Isolation of cardiomyoctes from hPSCs." Separate the cardiomyocytes using the PSC-Derived Cardiomyocyte Isolation Kit, human. Follow the protocol of the kit data sheet. The isolation is performed either as a single-step or two-step protocol, depending on the initial differentiation efficiency (see isolation strategy below). As a general guideline, we recommend performing the second (positive selection) step if the culture contains <50 % of cardiomyocytes. The standard protocol enables enrichment of cardiomyocytes from up to 5×10⁶ total cells, and upscaling is possible for up to 1×10⁷ total cells. Strategies for the isolation of hPSC-derived cardiomyocytes based on MACS® technology. Depending on the hPSC differentiation efficiency, different strategies for the magnetic enrichment of hPSC-derived cardiomyocytes may be applicable. For cell populations with low differentiation efficiencies, i.e., at cardiomyocyte ratios of <50 %, we recommend combining strategy A (depletion of non-myocytes) with strategy B (positive selection with cardiomyocyte-specific MicroBeads). At higher differentiation efficiencies (>50 %), strategy A is sufficient to achieve high cardiomyocyte purities. Depending on the hPSC differentiation efficiency, different strategies for the magnetic enrichment of hPSC-derived cardiomyocytes may be applicable. For cell populations with low differentiation efficiencies, i.e., at cardiomyocyte ratios of <50 %, we recommend combining strategy A (depletion of non-myocytes) with strategy B (positive selection with cardiomyocyte-specific MicroBeads). At higher differentiation efficiencies, (>50 %), strategy A is sufficient to achieve high cardiomyocyte purities. Cardiomyocyte Isolation Kit, and two LS Columns with a MidiMACS™ Separator. The cells were fluorescently stained with Anti-Cardiac Troponin T-FITC and analyzed by flow cytometry using the MACSQuant® Analyzer. Cell debris and dead cells were excluded from the analysis based on scatter signals and propidium iodide fluorescence. Isolation was performed on day 14 of differentiation using the Multi Tissue Dissociation Kit 3, the PSC-Derived Cardiomyocyte Isolation Kit, and two LS Columns with a MidiMACS Separator. The cells were fluorescently stained with Anti-Cardiac Troponin T-FITC and analyzed by flow cytometry using the MACSQuant Analyzer. Cell debris and dead cells were excluded from the analysis based on scatter signals and propidium iodide fluorescence. High purities of cTnT-postive cells and high percentages of MLC2a and MLC2v-positive cells. Cardiomyocytes enriched by depletion of non-cardiomyocytes using the PSC-Derived Cardiomyocyte Isolation Kit, human were characterized by flow cytometry and microscopy. 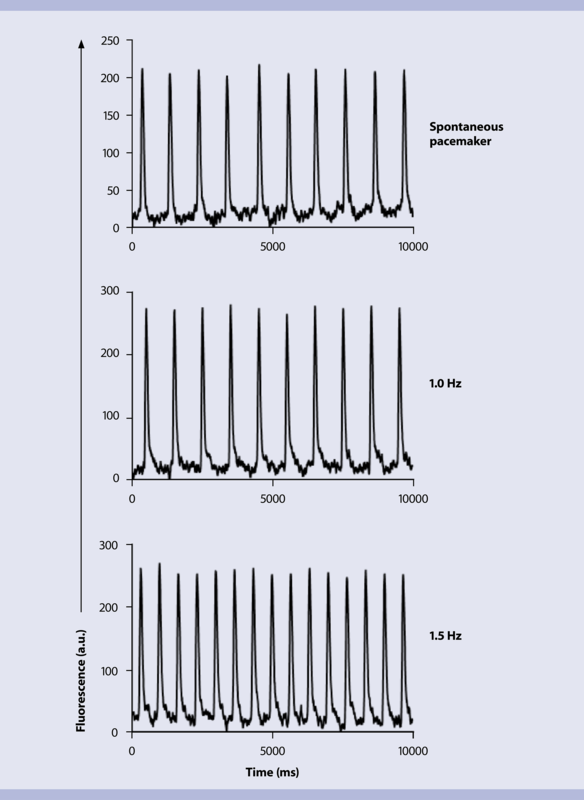 (A) Quantification of cTnT+ and MLC2a/v+ cells in the unseparated population (left bar), enriched cardiomyocytes obtained by positive selection of SIRPα+ cells (second from left) and the corresponding SIRPα– fraction (second from right), as well as enriched cardiomyocytes obtained by using the kit for depletion of non-cardiomyocytes (right). Cells were stained with antibodies for cTnT, MLC2a, and MLC2v, and quantified by flow cytometry. (B) Immunofluorescence microscopy of cardiomyocytes enriched by depletion of non-cardiomyocytes using the kit displayed high expression levels of cardiomyocyte-specific markers, N-Cadherin and cTnT. (A) Quantification of cTnT+ and MLC2a/v+ cells in the unseparated population (left bar), enriched cardiomyocytes obtained by positive selection of SIRPα+ cells (second from left), and the corresponding SIRPα– fraction (second from right), as well as enriched cardiomyocytes obtained by using the kit for depletion of non-cardiomyocytes (right). Cells were stained with antibodies for cTnT, MLC2a, and MLC2v and quantified by flow cytometry. (B) Immunofluorescence microscopy of cardiomyocytes enriched by depletion of non-cardiomyocytes using the kit. Functional characterization of cardiomyocyte monolayers derived from BJ-iPSCs after purification using the PCS-Derived Cardiomyocyte Isolation Kit, human. Following purification of hiPSC-cardiomyocytes using the kit, cardiomyocytes were re-plate as confluent monolayers and loaded with an action potential dye (FluoVolt™). In addition to spontaneous activations (top), monolayers were also paced at 1 Hz (center) and 1.5 Hz (bottom). The isolated cardiomyocytes possessed appropriate phenotype and were fully functional. Following purification of hiPSC-cardiomyocytes using the kit, cardiomyocytes were re-plated as confluent monolayers and loaded with an action potential dye (FluoVolt™). In addition to spontaneous activations (top), monolayers were also paced at 1 Hz (center) and 1.5 Hz (bottom). The isolated cardiomyocytes possess appropriate phenotype and are fully functional. 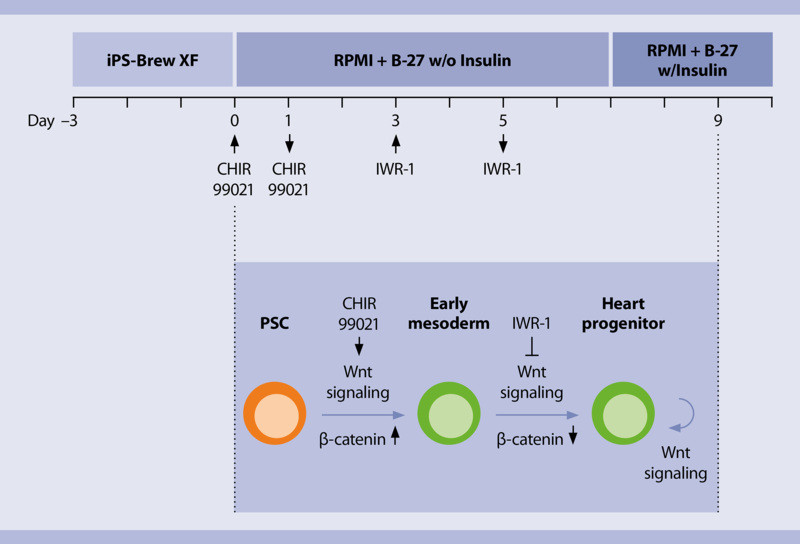 In recent years, various protocols to differentiate PSCs into cardiomyocytes have been published. However, the resulting populations are not homogeneous, but rather composed of a variety of cardiomyocyte subtypes or subpopulations, as well as non-cardiomyocyte cell types. Different cardiomyocyte subpopulations can be identified and analyzed using techniques such as patch clamp, immunocytochemistry or flow cytometry. Compared to other techniques, flow cytometry is a fast and efficient method to analyze and quantify different cell types within a cell population, without difficult techniques or genetic engineering of the starting material. Harvest cultured purified cardiomyocytes. See "Harvest and preparation of cells." Count isolated cardiomyocytes by flow cytometry using the MACSQuant® Analyzer 10. Transfer 5×10⁵ cells per staining into a 1.5 mL microtube and centrifuged at 300×g for 5 minutes. Remove the supernatant and resuspend the pellet in InsideFix (a component of the Inside Stain Kit) 1:1 diluted in DPBS. Incubate cells for 10 minutes at room temperature. Wash the cells with 1 mL autoMACS® Running Buffer – MACS® Separation Buffer and centrifuge at 300×g for 5 minutes. Incubate cells for 10 minutes at room temperature and in the dark. Wash cells with 1 mL Inside Perm and centrifuge at 300×g for 5 minutes. Remove the supernatant and resuspend the cell pellet in 250 μL autoMACS Running Buffer – MACS Separation Buffer. Analyze the stained cells on the MACSQuant Analyzer 10. Besides analysis by flow cytometry, cardiomyocytes are often examined by microscopy using immunofluorescence staining. Recombinantly engineered REAfinity™ Antibodies enable unambiguous analysis of cardiomyocytes. Wash cells cultures twice with PBS. Dilute Inside Fix (from the Inside Stain Kit) 1:1 with PBS. Fix cells with Inside Fix for 10 minutes in the dark at room temperature. Wash cells twice with PBS. Add the Anti-α-Actinin (Sarcomeric) pure or Anti-Cardiac Troponin T pure antibody 1:100 to Inside Perm, e.g., 1 μL antibodies to 99 μL Inside Perm. Add the antibody solution from step 5 to cells and incubate for 10 minutes in the dark at room temperature. Add an appropriate secondary antibody, e.g., Anti-IgG (H+L)-Vio® 515, 1:100 to Inside Perm. Add the solution to the cells. ▲Note: If using a cell nucleus marker, e.g., DAPI, add it at this point as well. Incubate for 10 minutes in the dark at room temperature. ▲Note: Samples can be stored at 2–8 °C in the dark for up to one week. Lian, X. et al. (2012) Proc. Natl. Acad. Sci. U.S.A. 109: E1848–E1857. Lian, X. et al. (2013) Nat. Protoc. 8: 162–175. Burridge, P.W. et al. (2014) Nat. Methods 11: 855–860. Zhang, J. et al. (2012) Circ. Res. 111: 1125–1136. Immunofluorescence staining with Anti-α-Actinin (Sarcomeric) or Anti-Cardiac Troponin T antibodies for microscopy (includes protocols for cultivated cells, acetone-fixed and formalin-fixed tissue sections). Noack, K., et al. (2016) Highly efficient immunomagnetic purification of cardiomyocytes derived from human pluripotent stem cells. ISSCR. San Francisco, USA.